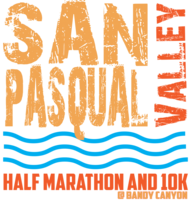 Welcome to the 2nd Annual San Pasqual Valley Half Marathon and 10K, this race is as scenic as it gets in San Diego County. Regardless of which distance you choose, runners will be treated to epic views as they race along the vineyards and orange groves of San Pasqual Valley. Wine at the finish line!! That's right... You read that correctly! We have partnered up with Old Survey Vineyards, to do a FREE wine tasting at the finish line. Each runner over the age of 21, will receive a custom branded wine glass at the finish line.